Being ill with a painful tonsilitis, which keeps me the week at home, I have a lot of time to spend with my blog. Lucky you! 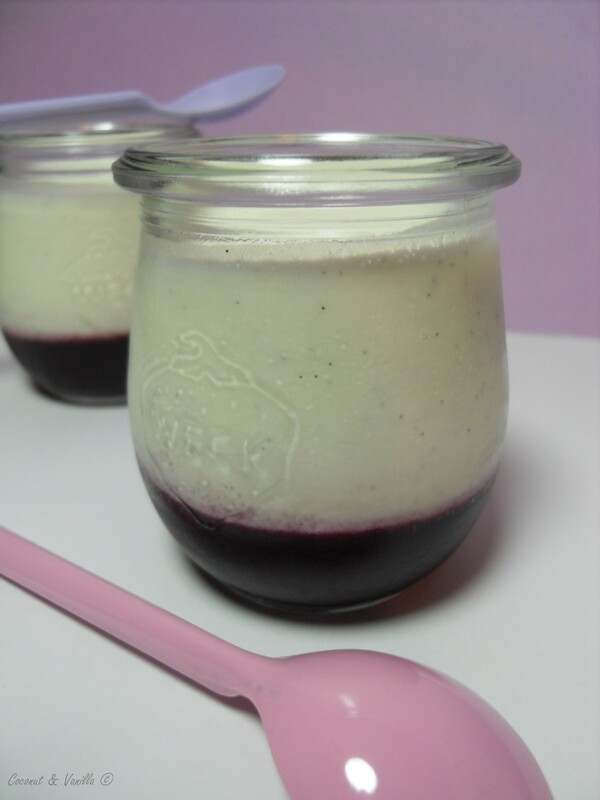 Last weekend I made those beauties: Buttermilk Panna Cotta layered on blueberry puree. Originally I wanted use up a mango fruit. I searched the internet and in the end I found a recipe at Tartelette’s. But as it came to peel the mango I realized it’s just over. Over ripe. Smelled a little bit alcoholic. So no dessert with mango then! 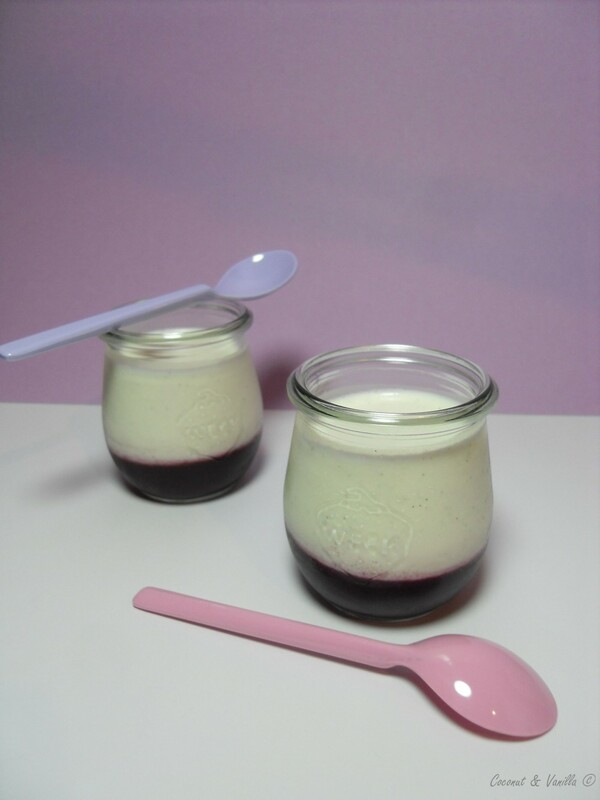 But I already liked the idea of panna cotta. I mean I love panna cotta! My favourite dessert is coconut panna cotta. But I always want to try something different, new. And the buttermilk attracted me. Luckily it came into my mind, that I still have some frozen blueberry puree. So after thawing the puree, I gave it into some nice glasses with the help of a funnel. And then I refroze the glasses with the puree. 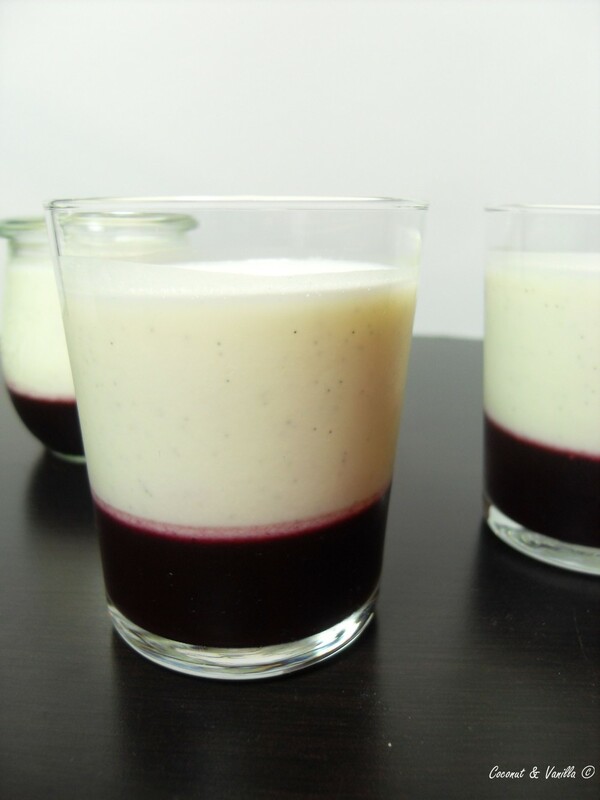 When it’s frozen it’s a lot easier to layer the panna cotta (or whatelse you like) on the puree so that they do not mix. The buttermilk gives the panna cottas a slight sour note. It tastes good, especially in combination with the fruit, but furthermore I prefer the classical preparation with cream. I used leaf gelatine. And maybe a little bit too much. The recipe I adapted was with powdered gelatine. As I am not used to it and I’m liking the leaves, I tried to adapt it. The panna cottas were a bit too firm, but still good. I used 3 and a half leaf. I think 2 and a half or 3 leaves are enough. If you want to use powdered gelatine, the original recipe calles for 4 grams (1 3/4 tsp.) dissolved in 1 Tbsp. water. And feel free to change the kind of fruit puree! I’m convinced, that it tastes delicious with (almost) every kind of fruit. Already thinking of apples, pears, quinces in this season or strawberrys in summer. Das Püree auf 4 hübsche Gläser verteilen. Am besten einen Trichter benutzen, damit die Gläser sauber bleiben. Die Gläser einfrieren. Einen tiefen Teller mit Wasser füllen und die Gelatine darin einweichen. Die Sahne mit dem Zucker, dem Vanillemark und der Vanilleschote aufkochen, dabei ab und zu umrühren. Vom Herd nehmen und alles durch ein feines Sieb geben. Die Gelatine ausdrücken und in die Sahne rühren, bis sie sich aufgelöst hat. 10 Minuten abkühlen lasse, dann die Buttermilch unterrühren. Auf Raumtemperatur abkühlen lassen (meine war nach Zugabe der Buttermilch nur noch lauwarm). Die Sahne auf das gefrorene Püree gießen. In den Kühlschrank stellen und für mindestens 2 Stunden kühlen. Oh, that sounds so delicious! Good job done!